The cruise ships dock in the center of town at the Quai D'Honneur. The Farmers & Craft market only a block away as well as a Casino Supermarket. A visitor center is at the pier. An lively Tahitian drumband welcomes you. Papeete is the capital of French Polynesia and is located on the largest of its islands, Tahiti. The city is the most important hub of French Polynesia with its waterfront and South Seas port frequently docked by waves of cruise ships, ferries, yachts, luxury liners, and cargo boats. 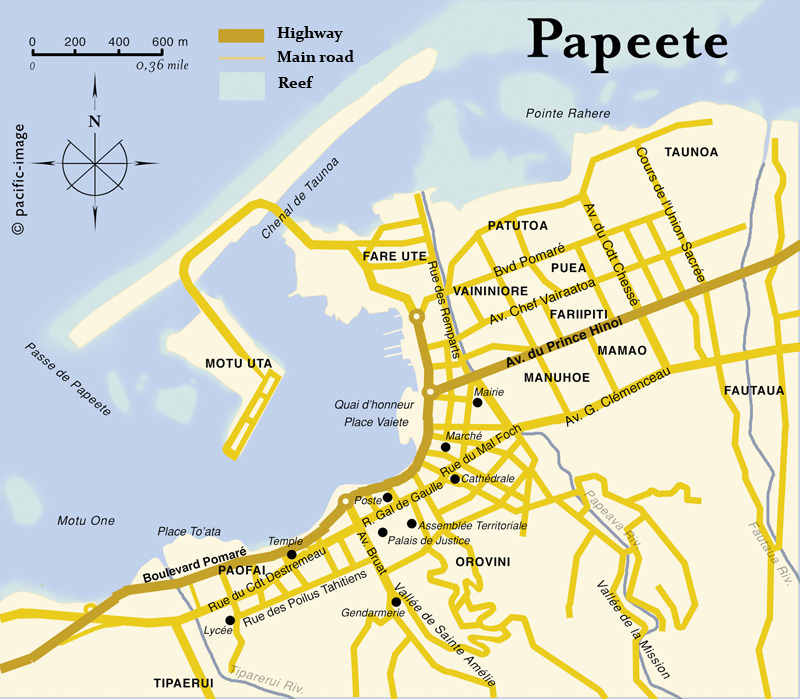 The heart of Papeete is perhaps its waterfront and port with its rows of docked boats. There is a walk-able promenade along the port, and this is the scene where many of the city's festivals take place. At night, the waterfront often plays hosts to "roulottes" or Tahitian dinners accompanied by festival-like, Polynesian performance shows. The most inexpensive and common form of transportation is the public bus system. The RTC large white coaches. During the day you can catch buses about every 20 minutes at official stops. There will be lots of taxi drivers at the pier area offering tours so you can go where you want and stay as long as you want with these taxis. A 4-5 hour tour for 4 people is around US$20 each. Renting a car will set you back around $120 a day. Moorea, it's only 12 miles away, a 30-minute ferry ride away. The ferry terminal is beside the cruise pier. Papeete is also home to many sidewalk cafes and multicultural restaurants – cuisines from Tahitian, to French, to Asian. Besides fine restaurants, the city also boasts a number of luxury resorts, spas, bars and clubs, chic shops, flea markets, and boutique French stores. Le Marché ("Municipal Market") is perhaps the most famous of Papeete's shopping ensemble. Hundreds of stands fill this public market selling everything from fruits, flowers, jewelry, shell necklaces, souvenirs, to Tahitian crafts and Tahitian oils. The market is very lively, and is definitely the place where all the action is. Be aware that imported goods can be very expensive here. Black Pearls are popular. Please familiarize yourself before buying. A 10 mm good quality will cost about $320. On Sundays enough stores are open to make it worthwhile. 1000 CFP francs = about 8.38 euros. US dollars and Euros are generally accepted. Official languages: French, Tahitian, locals in the touristy areas and shops speak some English. There is an Internet cafe at Vaima Center, directly opposite the cruise ship pier. Some open WiFi near the cruise dock.